This is not him. 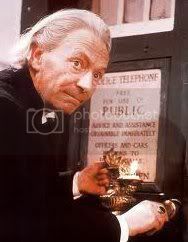 It's the First Doctor. About a week and a half to go. I'm still really burnt out on talking about the attempt. Seriously, if it weren't for the love and support of Mr. Stenoray, I'd greatly slack on practicing because OMG WHO CARES it's so close in time and it's not like i'll gain any more speed this close and aslkdfja;sldkfj. Not to mention without his encouragement, I wouldn't be in this race to begin with. Love you, Babe. Will I have the speed? I don't know. I'm really hoping to at least turn in a 370. On a good day I can get some stuff, and the tests will be only 60 seconds apiece, so we'll see what happens.